Developer Onni Group, which is pursuing a plan to build a high-rise apartment on the site of Seattle's Showbox theater, says it intends to nominate the building for landmark status. But it's unknown whether Onni plans to nominate the entire Showbox building, or just the facade or marquee or other feature. Since news broke earlier this week that Seattle’s Showbox theater would apparently be torn down under a plan to build a high-rise apartment, an outcry has erupted to save the storied music hall, perhaps by nominating it for landmark status. Now, it appears that very thing will happen — nominated by the developer itself. Vancouver, B.C.-based developer Onni Group said in a statement Friday that it will be “working with the Department of Neighborhoods to nominate the structure as a Seattle Landmark,” as part of the company’s preliminary plans, filed with the city of Seattle, to build a 440-foot, 442-unit apartment tower with ground-level retail and 88 parking spaces on the site on First Avenue between Union and Pike streets. RELATED STORY: Reader call-out: What are your favorite memories at the Showbox in Seattle? “The company looks forward to working with all stakeholders including the City and Landmark Preservation Board to determine the Landmark status of the building,” Onni said in its statement. Why would the developer of the site try to preserve the Showbox? Likely because nominating the music hall themselves would make the permitting and approval process from the city go faster, since the site seems destined to be nominated for landmark status eventually. Onni did this with the former Seattle Times building in South Lake Union, where the company is developing four residential and office towers on two blocks. In that case, Onni filed a nomination with the city’s Landmarks Preservation Board for the building and printing plant of the former Seattle Times building. Only the facade was eventually preserved and the rest of the building has since been demolished. It’s unknown currently whether Onni plans to nominate the entire Showbox theater building, or just the facade or marquee or some other architectural feature. Onni could not immediately be reached to respond to follow-up questions and has not replied to repeated requests for comment on its plans for the Showbox site this week. The 79-year-old Showbox music hall has hosted big acts from the Jazz Age to the grunge era to today’s pop stars. It has welcomed artists from Duke Ellington to grunge greats and a once up-and-coming rapper named Macklemore. In the past few months, the Showbox has hosted everything from stoner-metal favorites Sleep to a red-carpeted rock ‘n’ roll gala honoring Pearl Jam’s Mike McCready. It’s currently run by AEG Live, an international power player in the concert business. Onni said Friday that AEG would continue to operate the venue while the developer’s plans move forward. The possibility that the Showbox might be torn down prompted swift reaction from many in Seattle. 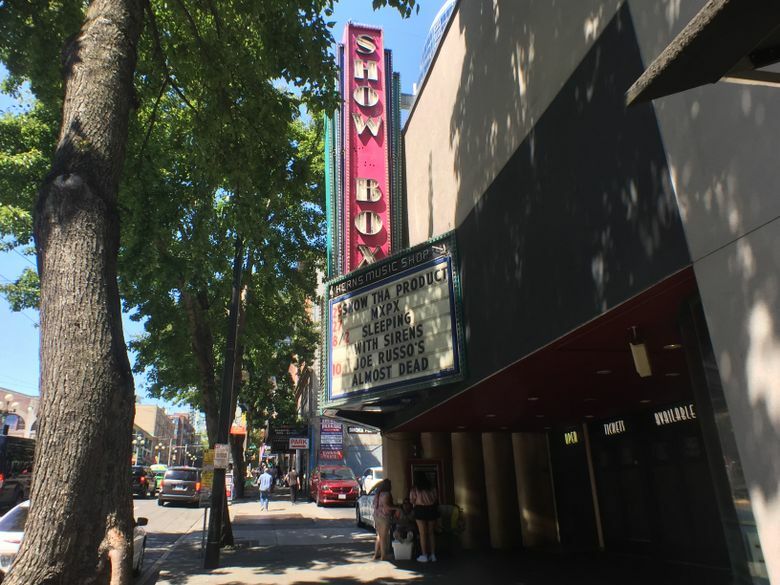 A change.org petition to nominate the Showbox as a historic landmark quickly gathered more than 60,000 signatures by Friday afternoon. Famous local musicians also voiced their support for preserving the music hall. Some local politicians voiced support for saving the Showbox too. Seattle Times music writer Michael Rietmulder contributed to this report. Janet I. Tu: jtu@seattletimes.com; on Twitter @janettu. Mike Rosenberg: mrosenberg@seattletimes.com or 206-464-2266; on Twitter @ByRosenberg.